It may seem counter-intuitive to some, but drinking spirits is good for you. Patrick Leclezio ponders the blessings of booze. First published in Prestige Magazine (July 2013 edition). During my adolescence one of my household tasks was to serve my father his daily libation. This may have been the source of my affinity for whisky. Back then however any such tendencies, if indeed they had been imbedded, were dormant. I had no inclination to drink any alcohol, much less spirits (such were the misguided delusions of my youth). I remember, as we went through the ritual, that he’d often attempt to instil in me the sentiment that a regular whisky was beneficial to one’s health. The apparent authority behind this wisdom was his father, his father-in-law, and the family doctor – all three whisky drinkers too. I was dubious. Undoubtedly I was a cynical lad, given to questioning just about everything, but this seemed altogether too convenient. I never quite believed it, and it slowly sunk into the recesses of my mind…until recently. My wife works extensively with Russians. A while ago, after a visit to the country, she mentioned that she’d been told that the average lifespan of a Russian man was 59. In fact it’s somewhere in the late-fifties to early-sixties depending of the study consulted, and the date thereof. A few years here and there notwithstanding this is a shockingly bleak situation; these guys are literally vodka-drinking themselves into an early grave. 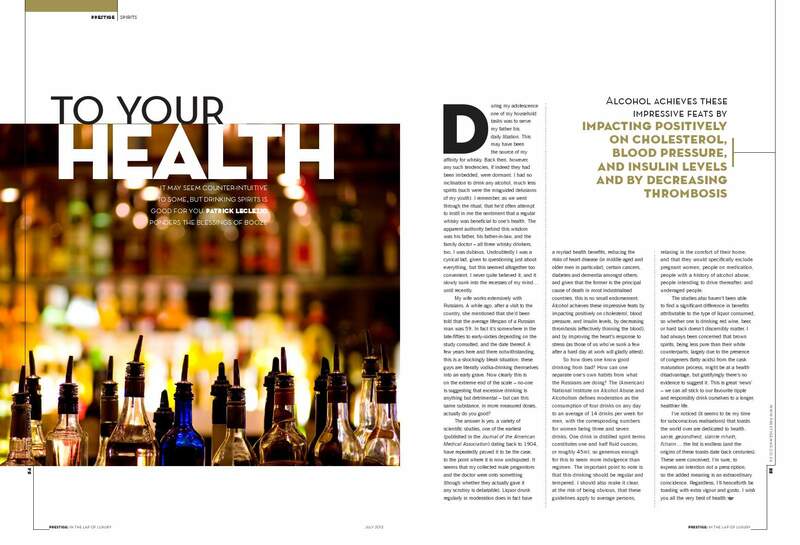 Now clearly this is on the extreme end of the scale – no-one is suggesting that excessive drinking is anything but detrimental – but can this same substance, in more measured doses, actually do you good? The answer is yes: a variety of scientific studies, one of the earliest (published in the Journal of the American Medical Association) dating back to 1904, have repeatedly proved it to be the case, to the point where it is now undisputed. It seems that my collected male progenitors and the doctor were onto something (though whether they actually gave it any scrutiny is debatable). Liquor drunk regularly in moderation does in fact have a myriad health benefits, reducing the risks of heart disease (in middle aged and older men in particular), certain cancers, diabetes and dementia amongst others; and given that the former is the principal cause of death in most industrialised countries this is no small endorsement. Alcohol achieves these impressive feats by impacting positively on cholesterol, blood pressure, and insulin levels, by decreasing thrombosis (effectively thinning the blood), and by improving the heart’s response to stress (as those of us who’ve sunk a few after a hard day at work will gladly attest). So how does one know good drinking from bad? How can one separate one’s own habits from what the Russians are doing? The (American) National Institute on Alcohol Abuse and Alcoholism defines moderation as the consumption of four drinks on any day to an average of 14 drinks per week for men, with the corresponding numbers for women being three and seven drinks. One drink in distilled spirit terms constitutes one and half fluid ounces, or roughly 45ml, so generous enough for this to seem more indulgence than regimen. The important point to note is that this drinking should be regular and tempered. I should also make it clear, at the risk of being obvious, that these guidelines apply to average persons, relaxing in the comfort of their homes; and that they would specifically exclude pregnant women, people on medication, people with a history of alcohol abuse, people intending to drive thereafter, and underaged people. The studies also haven’t been able to find a significant difference in benefits attributable to the type of liquor consumed, so whether one is drinking red wine, beer, or hard tack doesn’t discernibly matter. I had always been concerned that brown spirits, being less pure than their white counterparts, largely due to the presence of congeners (fatty acids) from the cask maturation process, might be at health disadvantage but gratifyingly there’s no evidence to suggest it. This is great ‘news’ – we can all stick to our favourite tipple and responsibly drink ourselves to a longer, healthier life. I’ve noticed (it seems to be my time for subconscious realisations) that toasts the world over are dedicated to health: santé, gezondheid, sláinte mhath, l’chaim…the list is endless (and the origins of these toasts date back centuries). These were conceived I’m sure to express an intention not a prescription, so the added meaning is an extraordinary coincidence. Regardless, I’ll henceforth be toasting with extra vigour and gusto. I wish you all the very best of health. Bottoms up! This entry was posted in Spirits column and tagged Distilled spirits, health, Prestige Magazine. Bookmark the permalink.